Click the images of affordable meat from Redmond, OR, to enlarge them. The quality of the meat you cook with can make a huge difference in the overall flavor and success of your next meal. That is why it is important for you to get only the finest cuts of the freshest meat. 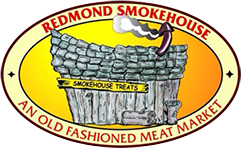 Redmond Smokehouse is a fresh meat market in Redmond, OR, that is dedicated to delivering you only the best meat at the fairest prices. From ground chuck to top sirloin, our fresh smokehouse meat is sure to deliver the mouthwatering flavor you expect to find when you buy from a meat market. We make it easy for you to find the exact cut you are looking for, whether you want something from our fresh meat case, one of our smoked specialty products, or some specialty sausages. We even carry a variety of fresh snacks for you to enjoy, including a variety of smoked meats and cheeses. When you look through our gallery, it’s likely your eyes will start to widen and your mouth salivate. Each picture of our meat opens up a world of flavor possibilities that both amateur and professional chefs will instantly want to explore. The meat we sell is only the freshest available, a difference you can see in our pictures and taste in every bite. Stop by our fresh meat market today to start browsing our current selection of freshly cut meat. We know that there is going to be something that speaks to you. There are also a number of affordable mixed meat packages available that allow you to enjoy a smorgasbord of options at a very fair price. In addition to serving you at our fresh meat market, our team also offers convenient mobile slaughtering services when you need a butcher to come out to your farm or location. We are skilled butchers that know how to properly slaughter and prepare any type of meat you are after. Contact us to learn more about the different types of meat available at our fresh meat market. We look forward to providing quality butcher services to customers located throughout the Redmond, Oregon, area.